GT3 Nismo R35 GT-R banging curbs. If you have a spare 35,000,000 yen (~$440,000) burning a hole in your pocket, and are looking to go GT3 racing, Nissan and Nismo have just the car for you. The 2013 MY, which would be like the 2014 US version GT3 Nissan GT-R goes on sale today. 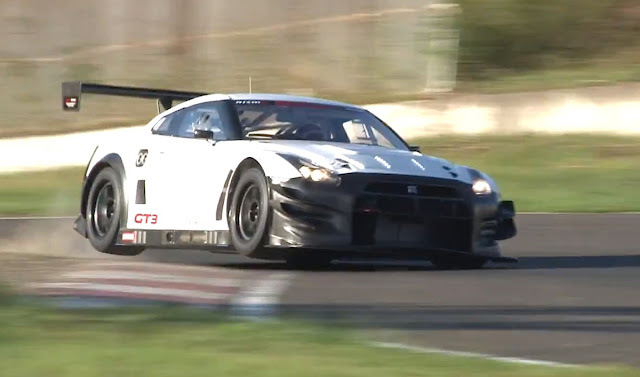 The most obbious visual difference for this update vs the previous GT3 GT-R are the front canards. Check out the video below, the the full press release under that. YOKOHAMA, Japan – Nissan Motorsports International Co., Ltd. (Nismo) is pleased to announce the official release of a Nissan GT-R (R35) that conforms to FIA GT3 regulations: the 2013 Model, Nissan GT-R Nismo GT3. Engine is the biggest contribution to performance enhancement, which includes new camshaft timing. Moving parts of the engine were also reinforced to guarantee durability. Several modifications were made to enhance aerodynamics: canards were added to the front and the front fender louvers were enlarged. The positioning of the rear wing was optimized. These changes improve aerodynamic balance between front and rear, and increased downforce, which enhanced overall aerodynamic performance. The 2013 model, Nissan GT-R Nismo GT3 is manufactured on demand. Orders will be accepted from November 13, 2012 on. Should the number of orders exceed production capacity, Nismo retains the right to make final decisions on order fulfillment. Sales and customer support for the Nissan GT-R Nismo GT3 will be implemented by Nismo for Japan, Asia, North America, South America, and Oceania, whilst our project partner, JRM, will continue to cover Europe, Russia and the Middle East, in the same way as 2012 Model. Enquiries should be made to either Nismo or JRM.